View all 99 products in this collection. View all 107 products in this collection. Although ArtCarved was founded in 1850, their name became reality in 1920 when they began to create carved designs in exquisite detail. The brand is very popular for bridal jewelry, but they also create fashion jewelry in precious metals and vibrant gemstones. With each handcrafted piece, the goal is to commemorate special moments in life with customized jewelry that will last for years. All ArtCarved engagement rings, wedding bands, and fashion jewelry are conflict-free. As a member of both the Kimberley Process and the No Dirty Gold (NDG) campaign, ArtCarved creates exquisitely beautiful jewelry while honoring the earth and its people. ArtCarved understands that because wedding rings are such a serious investment, many brides opt for classic styles that are sure to age with grace. In the Classic collection, simple solitaires are made a bit more special with a glittering band of pavé diamonds underneath the center stone setting. 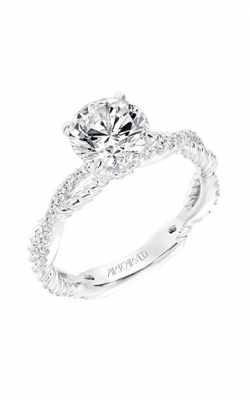 Others feature delicate twists and open metalwork right around the center diamond for just a touch of modern design. Brides who prefer intense sparkle may opt for a Classic collection ring with a diamond-studded band or a large halo. Diamonds decorate bands in one row or three for maximum shine. 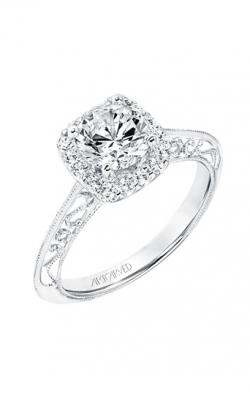 On the other hand, ArtCarved also knows that an engagement ring is very unique to the bride. Sometimes, a current style has a highly unique look that fits the bill. The Contemporary collection features trendy, innovative details like metal cable twist halos and two-tone metal bands. The metal-framed diamonds of the Bezel collection provide a sleek look fit for the modern minimalist. Although they are inspired by styles of old, Vintage collection rings offer a new take on Art Deco and regal glamour. Contoured settings lift center stones and ornate diamond halos slightly above the finger, allowing light to enter and reflect through the top. 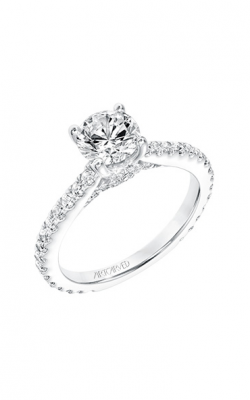 Why Shop for ArtCarved Engagement Rings at Northeastern Fine Jewelry? From its humble beginnings in 1980 as the Northeastern Coin Gallery, Northeastern Fine Jewelry has expanded to the greater Capital Region's highest volume jeweler. In addition to ArtCarved engagement rings and wedding bands, we offer other bridal jewelry, fine fashion jewelry, Swiss timepieces, and GIA-certified loose diamonds. Our services include jewelry and timepiece repairs, custom jewelry design, and onsite appraisals. For inquiries regarding our products, services, hours, and events, please visit one of our showrooms in Albany, Glen Falls, or Schenectady, NY. You may also visit our website or call 1-855-795-NEFJ.